Status Quo - "Just Doin‘ It"
They are the kings of Boogie – and they rock just like they ever did! As a doctor diagnosed a tumour at the vocal chords of Rick Parfitt in the christmas time 2005, the STATUS QUO-fans feared the worst. But fortunately the tumour was benign and the guitarist is fine again! Therefore the 12.000 people in the NEC in Birmingham were very happy on may 21st this year, as STATUS QUO went on stage and played an almost two hours concert with all their classic hits: ´Caroline´, ´Don´t Waste My Time´, ´Roll Over Lay Down´, ´Down Down´ and even ´Gerdundula´ up to ´The Party Ain´t Over Yet´ were resurrected. Not less than 20 white Marshall-Amplifier-Towers provided a roaring sound, an extra class stage setting and an audience in high spirits. 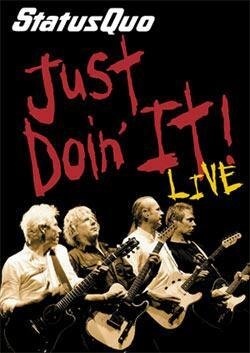 “Just Doin´ It” is the fitting title of the full-length live recording of this great concert. And it is not just a statement to the often cited “Rock´n´Roll will never die”, it is also the first official live release of the band from London after 15 years! Beside the recording of the power concert “Just Doin´ It” also contains some special features which give a little insight to the world of STATUS QUO: A nearly 20 minutes documentation including interviews with every member of the band, the promo video for last year´s single “The Party Ain´t Over Yet” and a photo gallery, whose pictures were completely taken by the fans during the Birmingham-Show. The subtitles can be shown in five languages, including German. “Just Doin´ It” is also published as a very limited edition in a luxurious clamshell box packaging, which also contains a live audio CD with 14 songs, an extensive 60 pages booklet, a poster and a lot of other gimmicks.